When it comes to historic hotels, none can compete with The Adelphi Hotel. Located in the centre of Liverpool, the Adelphi still retains its reputation as one of Liverpool’s most iconic hotels to date. The history of The Adelphi Hotel is one of the most fascinating in terms of hotels in Britain and contains an abundance of stories, spanning over the last two centuries. Liverpool itself celebrated its 800th anniversary in 2007 and is renowned for its charming appeal and character. The city was nominated as the annual European Capital of Culture together with Stavanger, Norway in 2008 bringing in a growing number of tourists to Liverpool. One of the most notable achievements in recent years has been its recognition by UNESCO which saw several areas of the city centre granted World Heritage Site status in 2004. 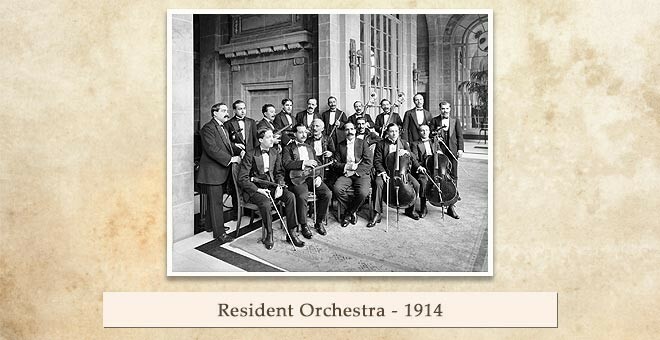 It all started in 1826, when hotelier James Radley opened a hotel building in Ranelagh Place, on the site of the Ranelagh Gardens, the first public recreation space in the city centre. 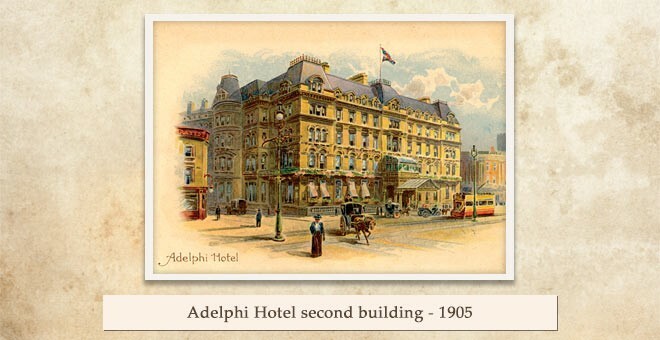 The hotel had a rather uneventful beginning until around 50 years after the grand opening, when the building was knocked down and the ‘second’ Adelphi was built in its place. Opening in 1876, the ‘second’ Adelphi held no resemblance to its predecessor, as this new version of the hotel aimed at providing a more luxurious feeling. With over 300 rooms and run by roughly 140 members of staff, the new building was the most eye-catching in the city centre and Mr Radley’s management made sure the hotel was a welcoming and comfortable environment that would make guests want to return. During this time period, the Adelphi was world-renowned not only for its service, but for its unique turtle soup, prepared from the basement of the hotel where there was a set of heated tanks to keep live turtles for the soup which was not only served, but was also distributed around the country for banqueting events. 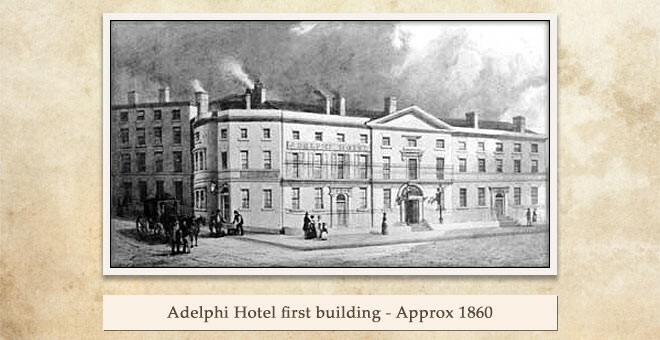 In addition, The Adelphi was regarded as Liverpool’s leading hotel of its time, with wealthy travellers often visiting before setting off from the local harbour. One of the most notable visitors to the hotel during the 1800s was Charles Dickens, who listed The Adelphi as one of his favourite hotels. He visited the hotel three times between 1826 and his death in 1870. With its glowing reputation, it was no surprise that other hotel chains were interested in taking over management of the hotel. In 1892, the Midland hotel chain was successful and James Radley handed the hotel over to another hotelier, William Towle. The hotel was also re-named the Midland Adelphi, to reflect new ownership. After 18 years of being handled by Towle, it was felt that the hotel was not keeping up with the changing times and needed to be renovated. This led to the building being demolished and construction began on a third building, which saw its grand opening four years later. 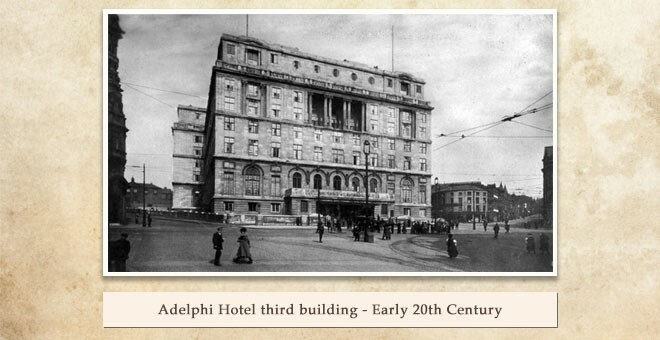 The ‘third’ Adelphi opened in 1914 and is the same building that stands to this day. The new building was designed by Frank Atkinson, and construction was left in the hands of one of the most renowned firms in Liverpool. Once again, the building outshone the one that came before; this time the magnificent structure housed a heated indoor swimming pool, tennis and squash courts, Turkish baths, shooting galleries and two restaurants that specialised in both French and English cuisine. It was also thought that this was the first hotel in the country to have these facilities. Yet what really made the new hotel stand out from the rest was the fact that each room was fitted with an amazing and state-of-the-art contraption: a telephone. During the early years of the 20th century, the Adelphi became one of the main arrival and departure points for those travelling on ocean liners, including the Titanic. 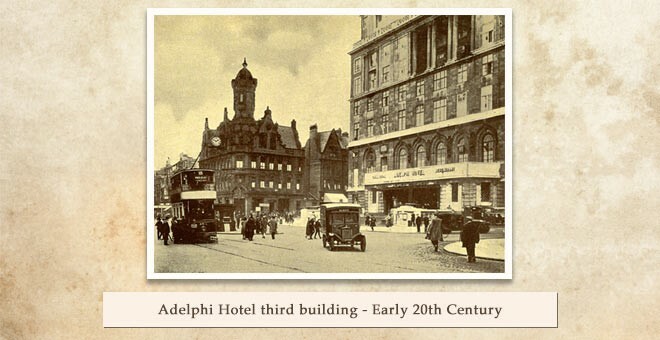 The Adelphi served as the most popular hotel in Liverpool for wealthy passengers before they embarked on their journey to North America. Liverpool became a common stop-over point and the Adelphi largely benefited from this, making it a leading hotel in the city centre. Wealthy guests continued to pass through the doors and celebrity guests also were seen to become increasingly popular. Inside the Adelphi, the grand lounge (the Sefton suite) was rumoured to have been replicated in the infamous RMS Titanic’s first class smoking lounge, however this has now been found to be false. Throughout the 20th century, the new Adelphi became a popular location for several politicians along with many other noteworthy celebrities. In the late 1940s, Prime Minister Winston Churchill was amongst some of the high-status visitors to stay at the hotel. Due to his fondness of the hotel he then went on to host strategy meetings at the Adelphi. Another Prime Minister to pass through the doors was Harold Wilson – whose preferred suite was later named after him and was kept virtually intact since his last visit. 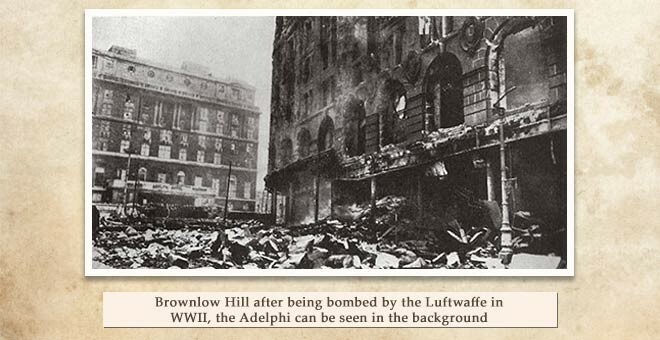 During World War II, the Adelphi narrowly missed being bombed in the Liverpool May Blitz of 1941, which saw many parts of the city centre ruined. Many foreign dignitaries, actors and pop stars including Frank Sinatra, Judy Garland and Bob Dylan have also been spotted at the Adelphi over the years. Iconic Liverpudlian star Cilla Black held her wedding reception at the hotel back in 1969. It was also rumoured that a 20-year-old Adolf Hitler worked at the hotel, however this has never been confirmed. On a tragic note, aristocrat Sir ‘Jock’ Delves Broughton was found dead in one of the hotel’s suites in 1941; he committed suicide after he was put on trial for the murder of his wife’s lover. 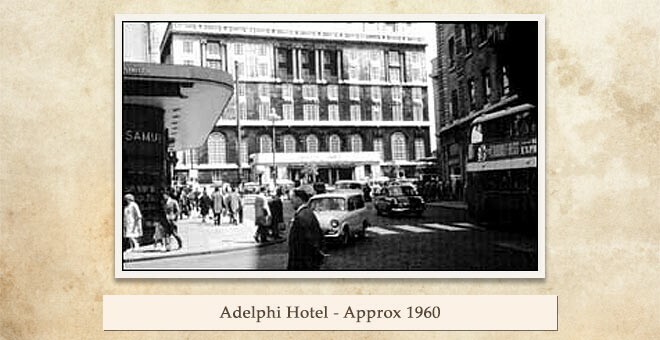 Throughout the years the Adelphi became known as Liverpool’s signature hotel for celebrities and politicians, making it a renowned flagship for Liverpool. In more recent years, the Adelphi hotel has been awarded a Grade II listed status by the English Heritage organisation, making it a very well-known property in the city. Although The Adelphi doesn’t bring in the same number of high status visitors as it once did, it still has a reputation as one of Liverpool’s most iconic hotels. Since Britannia Hotels bought the building in 1982, it has been renovated, rescuing the top two floors which had been virtually derelict after the last owners had closed them off. The hotel displays a seamless mixture of old and new, with the lower floors and public areas giving a more modern 21st century feel. However, the grand architecture and swimming pool retain their traditional charm with which the hotel was built. 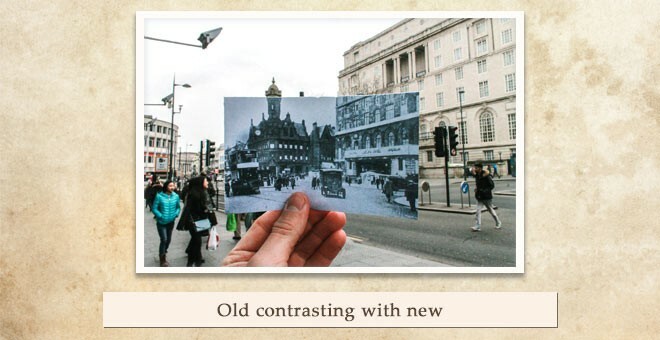 There is no doubt that the Adelphi’s journey has been a remarkable one, filled with fascinating history and stories over the years; yet it doesn’t stop there, as here at Britannia we are hoping to go on and create our own chapter in the history of the Adelphi and continue to hold its reputation as the flagship of Liverpool.